5.15pm: Shafee wants cautioned statement of witnesses and other documents to be given to the defence. He assured that RM1 million be paid tomorrow and then RM500,000 each other day until Sept 28. Judge Azura then fixed Nov 16 for mention. Shafee says he wants case transferred to High Court and Sri Ram indicates there is no objection. Najib is free to leave the court. 5.10pm: Shafee assures there won’t be any hiccups in payment of the bail. He quips that if payment of RM500,000 is made daily the bank downstairs would take half-a-day to count it. Mohd Nizar Najib and Mohd Shahrir Arifin are the sureties. Judge Azura ordered that bail money is paid in full by Sept 28. 5pm: Shafee asks what is wrong if Najib wants to influence public opinion, especially from the “barrage coming from the present PM and Finance Minister”. He says the minister cites freedom of speech and so, his client should be accorded the same. Sri Ram says the amount of money is huge. He says that the prosecution stands by the bail amount proposed earlier. Justice Azura Alwi fixes bail at RM3.5 million and says that the court does not see the need for Najib to be barred from attending public functions. Shafee assures that the bail will be paid in staggered amounts beginning tomorrow. Sri Ram says it is the court’s discretion. 4.45pm: Sri Ram says there are many statements made by Najib regarding the case and he wants to influence public opinion. This, he added are special circumstances whereby bail should not be granted. “This case involves the man (then) holding highest office in the executive of the country and he faces serious charges and he must realise the severity of the offence and (also so) the public may know. “The bail should not become a mockery. It is not correct to say RM500k would suffice due to the amount stated in the charges. “If this court wants, we can adduce affidavit from the authorities. If (the court) wants to grant bail, RM5 million is appropriate,” Sri Ram says. Shafee points out that RM2.03 billion was sent back by Najib to Tanore after the election on May 5, 2013. “They claimed RM2.282 but RM2.03 billion was returned”. 4.40pm: It is unclear if Najib can make bail if any is set. The bail office had closed at 4.30pm, and an officer with the office said that there were no instructions to extend operations for today. The officer said a bank account for bail to be posted can only be opened at the court’s Maybank branch after the court has set the bail amount. However, the court’s bank has closed for the day, with its metal shutters already pulled down. 4.36pm: Shafee proposes that since Najib has been given bail in the previous case, then this court should give bail. He suggested bail of RM500,000 with two sureties. Sri Ram replies that the amount involved in the charges amounts to RM2.28billion. He said the charges under Section 23 of the MACC Act 2009 are serious charges. Sri Ram added that Najib’s social status was “not sufficient grounds to grant bail”, and that it was “irrelevant” that he had enjoyed a high position in society. 4.25pm: Shafee says Najib had previously given three statements to the MACC, and had given the agency an additional statement since being charged this time around. He says Najib received a request from MACC at 10.30am yesterday to attend an interview, and had turned up at the agency’s headquarters at 3.30pm yesterday. Shafee mentions that his client had been detained overnight by MACC and comments on the action taken by the police. The prosecution objects to such a statement as it affects the integrity of enforcement agencies. 4.20pm: Shafee says it is unfair that his client is being asked to remain silent, while the media are not. Najib is seen leaning back while listening to Shafee’s submission. Shafee further said bail should not be punitive and added that Najib’s two international passport have been surrendered. For Najib to refrain from making public statements. Shafee says this is not possible, as Najib is an MP and he has to attend public functions. He adds that the second condition would be a violation of free speech, as attorney-general Tommy Thomas would say. 4.05pm: Sri Ram says he wants conditions imposed for fear Najib would interfere with this case. He says if bail is granted, it must be with two sureties. Shafee says that bail should be allowed. In this current situation, he says, the court has discretion to grant bail and can impose conditions. 3.56pm – Sri Ram says the prosecution objects to bail for the defence, given the seriousness of the offences. He noted that the US attorney-general Jeff Sessions had said that this was a case of “kleptocracy at its worst”. “We object as the accused has, in 2015, interfered in the case,” Sri Ram says. He pointed out that Najib had made statements on Twitter and Facebook “attacking the investigation of the authorities”. Shafee objected, and asked that the MACC senior officers be allowed to come and testify. Sri Ram wants the condition imposed that Najib does not say anything concerning 1MDB. 3.46pm: Prosecutors want a joint trial for all the charges as they arrive from the predicate charge of RM2.081 billion and involves the same account. However, Shafee objects to it. He also wants to know whether the hearing will be held in Sessions Court 8 or 9. On the bail application, the prosecution informs the court that all the 25 charges are not bailable. As such, Sri Ram says they are objecting to bail. However, if the court grants bail, they want it to be set at RM5 million. 3.20pm: Sri Ram asks for the other charges against Najib, which fall under money laundering, to be read out. That RM327 million was transferred to Tanore. That he abused his position as prime minister and finance minister on June 23, 2014 to receive more than RM49 million. In the second charge under Section 24(1) of the MACC Act, which Najib claimed trial to, he is accused of having abused his positions to secure RM90.9 million between Oct 31, 2012 and Nov 20, 2012. He is accused of having done so through his actions as finance minister on Feb 9, 2012, to approve 1MDB’s bid to take over Tanjong Energy Holdings Sd Bhd for RM10.6 billion, and then later, on Aug 10, 2012, approving 1MDB’s bid to take over Mastika Lagenda Sdn Bhd for RM2.75 billion. He is accused of subsequently approving 1MDB’s issuance of a 10-year structured loan note worth US$1.75 billion. 3.10pm: In the first charge, Najib is accused of having abused his position between Feb 24 and June 14, 2011 as a public officer, prime minister, finance minister, and chairperson of 1MDB’s board of advisors to misappropriate RM60 million for himself. This was done by asking the cabinet in April 1, 2009 to grant a government guarantee to Terengganu Investment Authority (TIA), which the latter used to secure a RM5 billion loan. Najib had then on July 29, 2009, as prime minister, ordered the federal government to take over TIA and renamed it as 1MDB, in which he had a direct interest. He is charged under Section 24(1) of the MACC Act 2009. Najib claims trial to this charge. 3.05pm: Sri Ram asks that the charges be read out. Shafee wants Sri Ram to show the authority for his appointment as a prosecutor. “Until today we have not got it,” Shafee says. Sri Ram undertakes to produce the document. 3.02pm: Najib walks in from the witness room. Ismail shouts out, “Boss!” and the former premier smiles. 3.00pm: Ismail walks into the courtroom with four supporters. Najib is in the witness room consulting with Shafee. 2.45pm: Outside the courthouse, about 20 of Najib’s supporters led by Umno vice-president Ismail Sabri Yaakob have gathered and are demanding to be allowed to go in. They are blocked by a team of police, including those dressed in riot gear. The situation becomes heated when the supporters argue with police that they should be allowed inside. After a discussion, police allow Ismail to go in. Five minutes later, the group of supporters is allowed in after they promise to behave and will not become unruly. 2.45pm: There are two US officials observing the proceedings. 2.31pm: Najib’s son, Norashman, walks into the courtroom. Meanwhile, Sri Ram introduces the various parties present, namely the prosecution, defence, and representatives from the Malaysian Bar. He shows the note of consent to prosecute Najib, and asks it to be marked by the court. He wants the four MACC charges to be read out. Shafee wanted a copy of the charges earlier, saying they had been unable to advise Najib. He suggests that no plea be taken when the charges are read, or that a short adjournment be called. 2.25pm: The court is about to start with Sessions judge Justice Azura Alwi presiding. The court interpreter and all lawyers are seated. Najib walks in and is seated in the dock. 2.15pm: MACC deputy chief commissioner (operations) Azam Baki walks into the courtroom and sits in the front row of the public gallery. Najib is still in the witness room, waiting to be brought out. Lawyers are taking their places in the packed courtroom. 2.10pm: Shafee arrives in the courtroom with his defence team, which includes Havinderjit Singh, Farhan Shafee, and Farhan Read. Lawyer Kumaraendran, who is holding a watching brief for Rosmah, is also in court. So far none of Najib’s family members have been sighted. 2.10pm: Umno supreme council member Ahmad Maslan prays for Najib to be strong in facing his tribulations. “May he be granted justice. Truth will be upheld if the courts are fair,” he tweeted. 1.50pm: Najib arrives at the Kuala Lumpur court complex and is swarmed by journalists and photographers. He is then led into court where Sri Ram is waiting. 1.35pm: Najib leaves the Commercial Crime Investigation Department (CCID) four hours after he was brought there for questioning. Escorted by police and MACC officers, the former prime minister appears to be in high spirits and is seen smiling and waving to the media. He is taken into a black unmarked Toyota Wish, believed to be headed to the Kuala Lumpur Court Complex where he is to be charged. 1.30pm: Former premier Najib Abdul Razak will be brought to the Jalan Duta Court complex in Kuala Lumpur today, for the third time, where he is expected to be slapped with a whole new slew of charges in relation to the 1MDB probe. 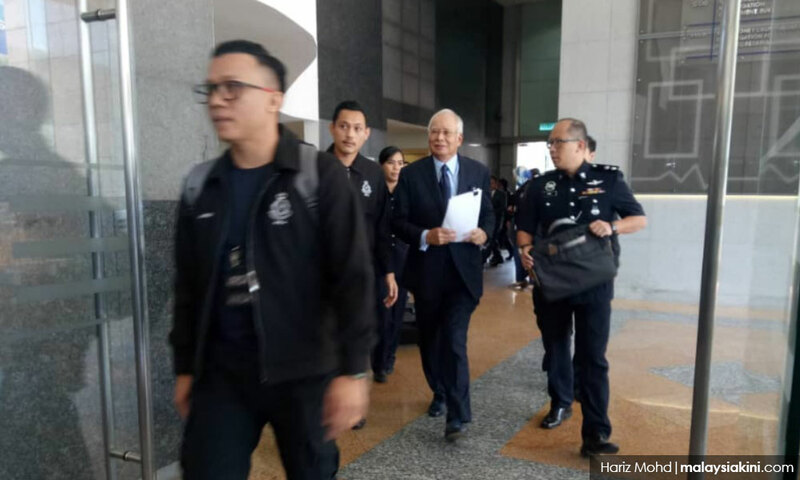 He will first be taken to the Kuala Lumpur Sessions Court, where police have stated that Najib will face 21 counts in relation to alleged money laundering in connection to the RM2.6 billion he purportedly received in his personal bank account. These do not include the four proposed charges to be levied by the MACC under the MACC Act today. Najib was arrested yesterday and held overnight by the MACC. He was brought to the Commercial Crime Investigation Department (CCID) building this morning for further questioning. Two truckloads of police personnel have been stationed outside the court as Najib supporters are expected to start gathering at 2.30pm. The prosecution is expected to be led by former Federal Court judge Gopal Sri Ram, while senior lawyer Muhammad Shafee Abdullah will appear for Najib. Lawyer K Kumaraendran is expected to appear for watching brief for Najib’s wife Rosmah Mansor. The Malaysian Bar is holding a watching brief in the case. It will be represented by secretary Roger Chan.